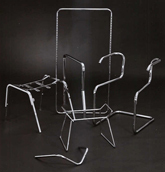 Decorative chrome plating is our specialty! 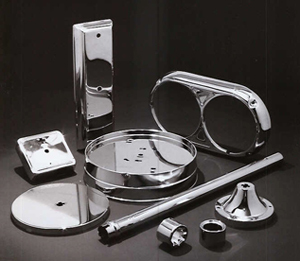 Decorative chrome plating is usually applied to a nickel plated deposit which is applied to a steel, plastic, copper alloys, stainless steel or aluminum. In this plating application, the thin layer of chrome protects the nickel from oxidation and tarnishing. The nickel layer underneath provides the luster. It is used in a number of applications for example appliances, hand tool, retail displays hardware, auto trims and furniture just to name a few. Using our skilled/experienced polishers we can hand work and smooth out or remove all imperfections in the base material before chrome plating. After chrome plating is complete you are left with a part that you can see yourself in its luster. 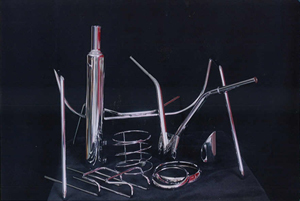 As an example car bumper, motorcycle parts and furniture are plated to a mirror finish. In this process the Chrome is applied directly to Stainless Steel. Parts can be plated as they are or parts can be either hand polished to a mirror finish or Electropolished before Flash Chroming. Flash Chrome provides a protective top coat that adds a Bright Protective Finish. This process is used commonly on Exhaust Tailpipes and Fishing Rods. We at Olymco have the capabilities of using two types of decorative chrome plating baths. Our traditional hexavalent chromium plating bath deposits neutral chromium metal onto part surfaces. Although hexavalent chromium, a hazardous substance, is present in our plating bath, the chromium metal is deposited onto your component parts in its neutrally charged, non-hazardous molecular form. This should not be confused with the hexavalent chromium passivation dips often used as a protective topcoat by zinc platers. Olymco also uses trivalent chromium plating baths. These baths are hexavalent-chromium-free and can deliver a decorative chrome finish appearance very similar to the traditional bright chrome color. Olymco can Chrome Plate to many different specifications whether they are inside specs or outside specs needing several layers of nickel. Just tell us what the specification is.